As Ryan Murphy, Hertz Rent A Car, and a million TV legal pundits from the ’90s already know, there’s nothing like a little O.J. Simpson to juice up your ratings. That truism was proven yet again yesterday by the viewing figures for Simpson’s successful parole hearing, with Variety reporting that 13.5 million people tuned in to watch a Nevada parole board grant him his eventual freedom. 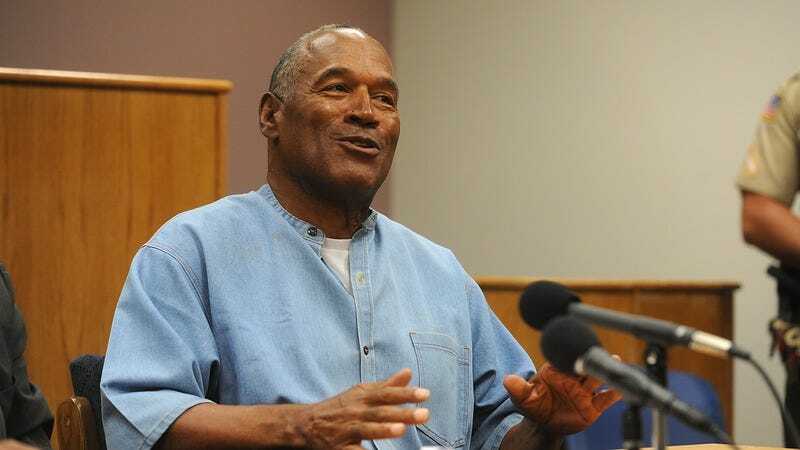 (The L.A. Times called those numbers a “dud,” relative to other Simpson TV milestones like the white Bronco chase, but it still seems like a lot of people watching a man smile from behind a table.) This, despite the fact that Simpson restrained himself from pledging to find the real guy who broke into a Las Vegas sports memorabilia store eight years ago, in order to steal O.J. Simpson’s old trophies. And while the trades are full today of editorials laying out the pretty obvious reasons the former Naked Gun actor should never work in Hollywood again, there’s also considerable speculation about who’s going to score the first TV interview with Simpson after his release (which could come as early as October 1). After all, if O.J. Nostalgia Fever can drive so many people to watch a pretty standard Nevada legal proceeding, the network news shows must be salivating over the ratings they’ll pull with an interview with the man himself.